Spoiler from 2ch and translated by an Anon in 4chan. Luffy tells Otama that Ace has passed away. Otama is shocked and loses her consciousness. Tengu gets mad at Luffy saying that even if it’s the truth, he shouldn’t have told her now. Tengu is a swordsmith. He too has been waiting for someone for a long time. The place they are living in right now is called Amigasa village and it used to be a normal village, but one year ago, Kaidou’s army’s headliner Drake destroyed the whole village. The only place that is flourishing in Wano right now is where Orochi is living, the flower town. All other places were turned into a wilderness by Kaidou. 4 years ago, the Amigasa village was so poor that people were starving to death, and one pirate ship arrived. As the pirates were weakened, the people from the village, tied the pirates up and took their food away. Once everyone from the village have finished eating, one pirate was able to easily untie himself. And that pirate was Ace. He intentionally let himself tie up and shared the food with them. Once they realize that, they thank Ace, and Otama especially was attached to Ace. Once Luffy finished hearing that story, he takes Otama to see a doctor. Tengu tells him that he will stand out like that, so he gives Luffy his own clothes. 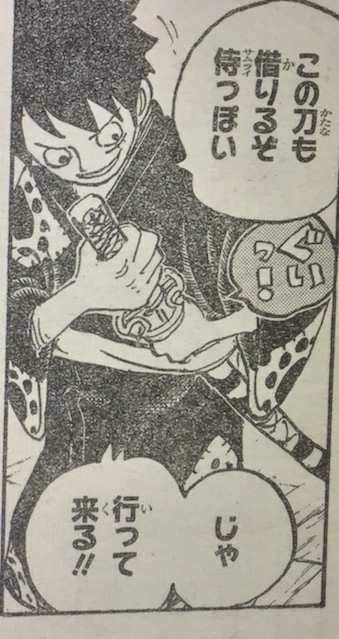 Luffy wants to take the Katana that he found in the house with him, but Tengu doesn’t allow Luffy to take it with him. The katana that Luffy tried to take was “Nidai Kitetsu”. So Luffy suggests that he will exchange this with the katana Tengu is carrying. But Tengu says the Nidai Kitetsu is cursed so he doesn’t want to touch it. Although Tengu tries to stop Luffy, he still takes the Nidai Kitetsu with him. He rides on the Komainu, and Otama wakes up. Otama accuses Luffy of being a liar and rampages. Ace promised her that once Otama becomes a great Kunocihi, she is allowed to go out to the seas with Ace. Once they get out of the bamboo groove, it’s exactly as Tengu said, it is wilderness. Beyond the wilderness, there are several factories, and in the wilderness, there are ferocious animals fighting against each other. Luffy wants to beat the animals and eat them, but apparently those animals also have drunk from the poisoned water, so he can’t eat them. On their way, there is a bad guy chasing women, but that bad guy gets easily beaten by a swordsman. 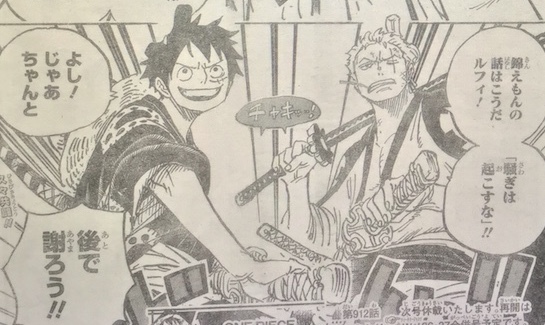 Once Luffy looks carefully, he realizes that the swordsman is Zoro. They are happy that they were able to meet again, but at that moment, Hawkins appears with his underlings.